When Tamara invited me to design a square for the #MooglyCAL2017 I was very excited and honored to receive the invite, but that excitement was quickly replaced with anxiety because…. well, the truth of the matter is, I had never designed an afghan square before! Eek! I surely couldn’t admit that to her, right? As I watched time tick on by, I became increasingly anxious about designing this square. “What on earth was I going to design? Would a design come to me in time? Oh my gosh I forgot to place my yarn order!” These and many other thoughts raced through my head as the deadline quickly approached! Then one day it hit me! Cables…. I needed to design a cabled square. 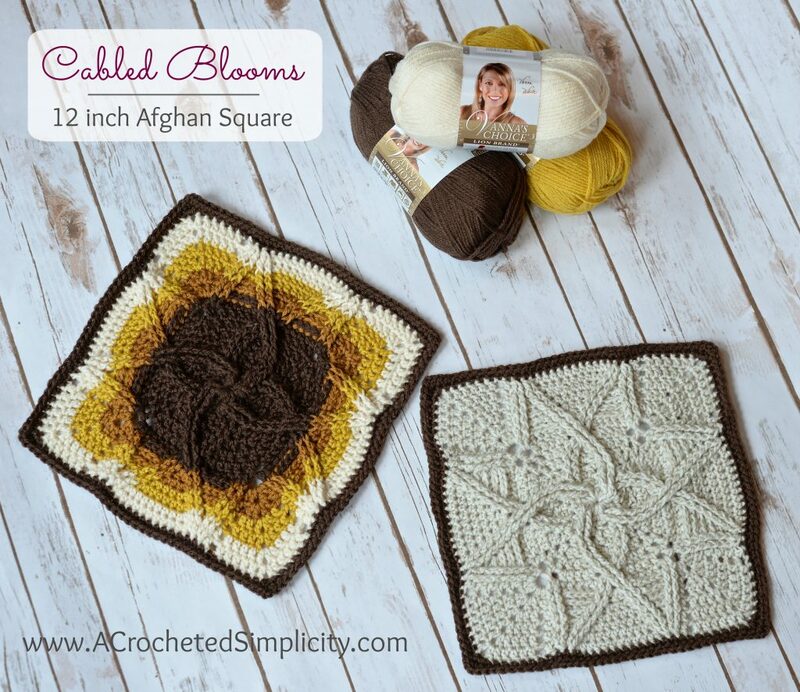 Once I had decided to stick with something I loved, the rounds of the square seemed to crochet themselves and the Cabled Blooms Afghan Square was born. Measurements noted throughout the pattern. Cable A: skip the next 2 sts, fptr around each of the next 2 sts, working in front of the fptr just made, fptr around each of the skipped sts. The first stitch of each round is worked in/around the same stitch as the beginning chain, unless stated otherwise. Each ch-1 space worked within a round is counted as a stitch. Color combinations shown in the photos. Solid square w/ dark border: Rnds 1 – 14 (Pearl Mist), Rnds 15 – 16 (Chocolate). Rnd 1: Begin w/ a Magic Ring, ch 2 (does not count as a st), work 20 dc into MR. Join w/ a sl st to the 1st st. (20 sts) *Approximately 1.625” dia. Rnd 2: Ch 1, [ Cable A, (dc, ch 1, dc) in the next st ] rep from [ to ] around. Join. (28 sts) *Approximately 2.5” dia. Rnd 3: Ch 1, [ fpdc around each of the next 4 post sts, dc in the next st, ch 1, dc in the next ch-1 sp, ch 1, dc in the next st ] rep from [ to ] around. Join. (36 sts) *Approximately 3” measured across cables. Rnd 4: Ch 1, [ fpdc around each of the next 2 post sts, work (dc, ch 1, dc) between the 2nd & 3rd post sts from Rnd 3, fpdc around each of the next 2 post sts, skip next dc, dc in next ch-1 sp, ch 1, skip next dc, dc in next ch-1 sp, skip next dc ] rep from [ to ] around. Join. (40 sts) *Approximately 3.75” square. Rnd 5: Ch 1, [ fpdc around each of the next 2 post sts, 2 dc in next st, ch 1, dc in next ch-1 sp, ch 1, 2 dc in next st, fpdc around each of the next 2 post sts, dc in next st, dc in next ch-1 sp, dc in next st ] rep from [ to ] around. Join. (56 sts) *Approximately 4.25” square. Rnd 6: Sl st over to the 1st dc (remember to work the first st of the rnd into this same st), ch 1, [ 2 dc in the next st, dc in next st, ch 1, dc in next ch-1 sp, ch 1, skip next st, dc in next ch-1 sp, ch 1, dc in next st, 2 dc in next st, fpdc around each of the next 2 post sts, skip next st, sc in next st, skip next st, fpdc around each of the next 2 post sts ] rep from [ to ] around. Join. (64 sts) *Approximately 4.75” square. Rnd 7: Ch 1, [ 2 dc in next st, dc in each of the next 2 sts, dc in the next ch-1 sp, (ch 1, skip next st, dc in next ch-1 sp) twice, dc in each of the next 2 sts, 2 dc in next st, Cable A (skipping over sc between the post sts) ] rep from [ to ] around. Join. (68 sts) *Approximately 6” square. Rnd 8: Ch 1, [ dc in each of the next 5 sts, 2 dc in the next ch-1 sp, ch 2, 2 dc in the next ch-1 sp, dc in each of the next 5 sts, fpdc around each of the next 4 post sts ] rep from [ to ] around. Join. (80 sts) *Approximately 7.25” at this point. Rnd 11: Ch 1, [ skip next st, bpdc around each of the next 2 post sts, fpdc around each of the next 2 post sts, dc in next st, ch 1, dc in next 2 sts, (dc, ch 1, dc) in next ch-1 sp, dc in next 2 sts, ch 1, dc in next dc, fpdc around each of the next 2 post sts, bpdc around each of the next 2 post sts, skip next st, fpdc around each of the next 2 post sts, 2 hdc in next st, hdc in next 2 sts, 2 hdc in next st, fpdc around each of the next 2 post sts ] rep from [ to ] around. Join. (116 sts) *Approximately 9.50” at this point. Rnd 13: Sl st over to 1st dc (remember to work the first st of the rnd into this same st), ch 1, [ dc in next st, ch 1, dc in next 4 sts, (dc, ch 1, dc) in next ch-1 sp, dc in next 4 sts, ch 1, dc in next st, fpdc around each of the next 4 post sts (skipping over post st between 2nd & 3rd post st), 2 hdc in next st, hdc in each of the next 6 sts, 2 hdc in next st, fpdc around each of the next 4 post sts (skipping over post st between 2nd & 3rd post st) ] rep from [ to ] around. Join. (132 sts) *Approximately 11.25”. Give your work a professional finish by blocking it! 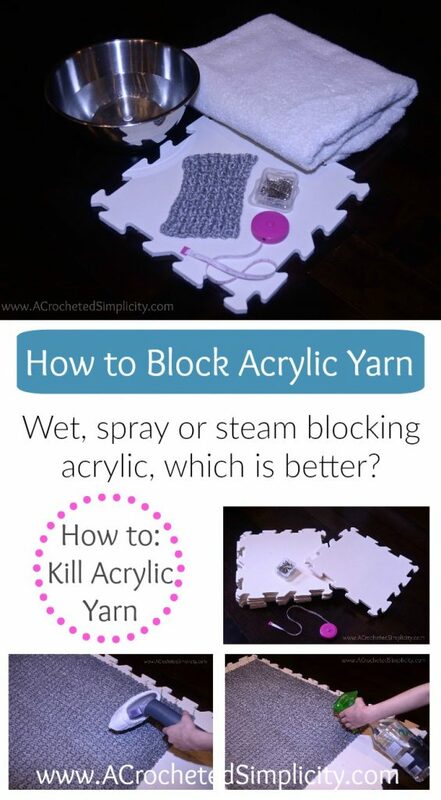 Click here to learn 3 different ways to block acrylic yarn. I chose to steam block to really relax my cables, which technique will you choose? Do you LOVE crocheted cables? 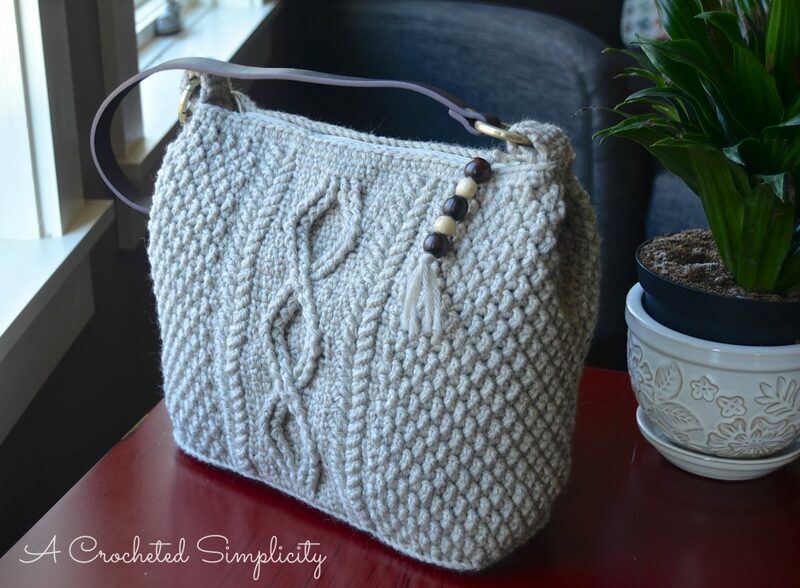 Visit my Ravelry shop to check out all of my cabled designs, including the Cateline Cabled Bag shown above. Click here to visit! Thank you for this pattern, its really lovely.